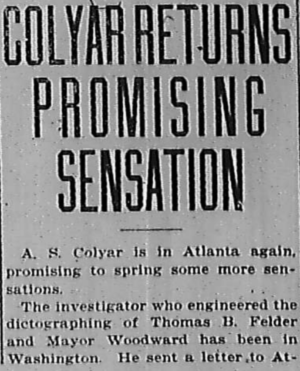 A. S. Colyar is in Atlanta again, promising to spring some more sensations. The investigator who engineered the dictographing of Thomas B. Felder and Mayor Woodward has been in Washington. He sent a letter to Atlanta before him, saying he objected to being made a goat. It is believed Colyar saw George M. Gentry while in Washington and got from him an affidavit. This is said to be much the same as the one printed admitting that the dictograph records had been padded, as charged in Gentry’s recent affidavit, but that the general charges were upheld. “He laughs best who laughs last. When you get tired publishing all of the lies the gang of political crooks are publishing on Lanford and myself I may be able to give you a story that will cause some people to sit up and take notice. “It’s indeed comforting to think one purchased affidavit can cause a certain man in Atlanta to consider himself vindicated completely. Whitewash is cheap, as we all know. “Then there is Mayor Woodward. He says ‘Colyar went to Mrs. Gentry’s house and worried her.’ Indeed, where did he learn this? It’s news to me. But we all know the Mayor. He is the same Mayor Hon. R. F. Maddox defeated after he (Woodward) was nominated by his party, and all Atlanta knows why. Let them make a goat out of me and see what I publish in my own defense. Speculation was rife Monday as to the nature of the trip of Colonel Thomas B. Felder, who left Atlanta Sunday afternoon with the statement that he was bound for Cincinnati. Rumors had it that Colonel Felder in reality is on his way to Washington, for the purpose probably of conferring with George Gentry, the missing stenographer in the recent dictagraph sensation. If this is Colonel Felder’s intention, he kept it to himself. It has been suggested that Colonel Felder would feel much safer in going to Washington by way of Cincinnati than through the State of South Carolina.